Award winning vegan chef Bettina Campolucci has launched her first book – Happy Food. After being diagnosed with Polycystic Ovarian Syndrome and endometriosis, Bettina began to adjust her approach to food: exploring new ways to heal her body and mind. During this time, Bettina also documented her recipes on her blog bettinaskitchen. As well as having published a selection of recipes, Bettina also runs successful workshops in London, sharing her knowledge on different foods and their effects on mental health, wellness and female health in particular. Throughout these workshops, Bettina also teaches participants how to make cheese, bread and milk without dairy or gluten/wheat. Ultimately, highlighting how much money can be saved from making milk at home from nuts or pumpkin seeds. Batch cookable, freezable, lasts for +5 days in the fridge. Preheat the oven to 190C (375F/Gas 5). Line a 20cm square cake tin with greaseproof paper or use a good-quality silicone mould. Start with the pudding. In a small saucepan gently heat the milk and dates for 5–10 minutes until the dates have softened. Once softened, set aside. In a blender, blitz the coconut sugar and coconut oil until the sugar has mostly disintegrated. Add the bicarbonate of soda to the milk and date mix – it will start to fizz and bubble, but that is okay. In a bowl, combine the flour, vanilla, spices, pinch of salt, coconut oil and sugar mix along with the dates and milk mixture and give everything a good stir. Pour into the cake tin and bake in the oven for 30 minutes. While the pudding is cooking, make the sauce. Heat a pan over medium heat, add the coconut sugar and coconut milk and let it heat through. Add the salt and bring to a boil, then reduce to a simmer and let it simmer for 20 minutes until the caramel has thickened. Stir it occasionally to make sure it doesn’t burn. A great way of knowing if it’s ready is to see if it sticks to the back of your spoon. Stir in a little more salt if desired and either use it straightaway or let it cool down before storing in a glass jar – it will become even thicker as it cools. 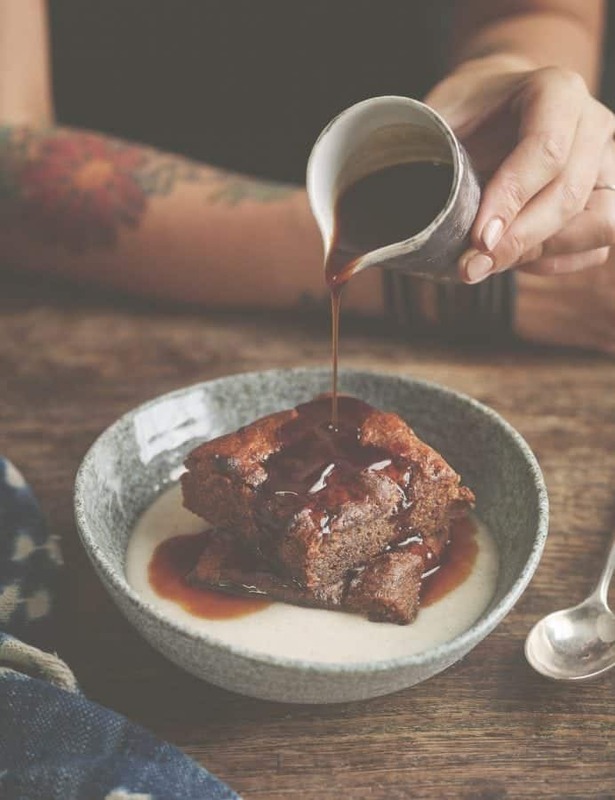 Once the cake is done, transfer to a wire rack to cool and enjoy with a home-made custard and a drizzle of sticky toffee sauce. Tip: The cake, custard and toffee sauce all last for a long time in the fridge – well, that is, if you can keep your hands off them! – or freezer. Blend the cornflour with a little bit of of the coconut milk in a medium pan over a medium heat, whisking until you have an even consistency. Then add the rest of the ingredients including the scraped vanilla pod – there is still a lot of goodness there – whisking until the cornflour and vanilla are fully incorporated into the coconut milk. Whisk until the custard starts to thicken and then, as soon as the mixture begins to boil, take it off the heat and let it cool. Mix all the flours together and store in an airtight container. Recipe adapted from Happy Food by Bettina Campolucci Bordi (Hardie Grant, £20). A list of Bettina Campolucci’s upcoming events can be found here. Instagram: @bettinas_kitchen.